Studio unit at one of the prettiest low rise condominiums on Maui. Our recently remodeled 3rd floor studio unit (sleeps 2) at Papakea has been our home away from home for over 30 years. 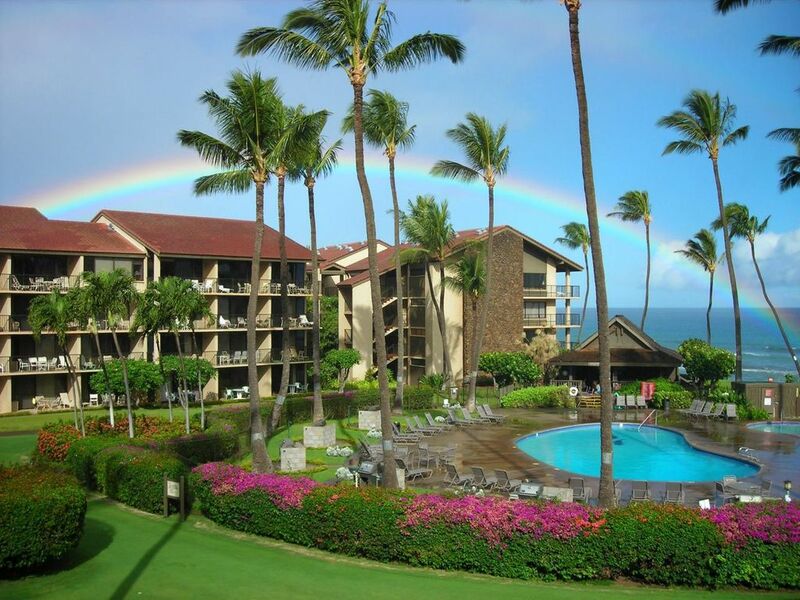 Located in the "B" building , it has beautiful views of the ocean and the islands of Molokai and Lanai. The unit comes with a fully equipped kitchen with a microwave, stove and dishwasher, washer/dryer, TV, WiFi , and a queen size Murphy bed. Resort amenities include lush tropical gardens, swimming pools, hot tubs, putting greens, tennis courts, and BBQ grills. A small shopping center including a grocery store is just across the street and eating establishments of all kinds are within walking distance. Papakea is only a short drive to Lahaina where shopping and restaurants abound. Beaches with all of the usual activities (snorkeling, swimming) are also very close. We fell in love with Papakea on the very first day we saw it and are positive you will too. One bathroom with shower (no tub). Single sink vanity. We enjoyed every moment of our stay here. This place had everything you need and then some. The view of the ocean is breath taking, the space is clean and inviting, and the owners thought of every detail to make the stay comfortable! The essentials were covered (lots of towels, toilet paper, paper towels, trash bags) and the extras were above and beyond (spices for cooking, beach equipment). The location is great - a quick drive to town and close to lots of amazing beaches. The resort was clean and had a great pool, hot tub, shuffle board, and plenty of seating. The crowd is a lot of families and older couples. We felt this was a great value - we couldn't find anywhere else in this price range that had this much to offer! We already are planning our next trip back. Thank you for the wonderful week! This was our 3rd trip to Maui and we loved this location. The condo had everything we needed! Thank you!! Papakea property is beautifully maintained. The grounds are immaculate, the gardens are beautiful. Richard's unit has the best view. Loved sitting on the lanai having breakfast in the morning, overlooking the grounds and the ocean. The unit is very cozy and well appointed. Everything one needs is in it. Very comfortable bed. Papakea is gorgeous! Very well kept and in a fantastic location. Couldn't have asked for more! The Papakea was a fabulous choice for our vacation. With 2 pools, 2 hot tubs, putting greens, lily koi ponds, an a stunning oceanview. We loved waking up to an ocean/pool view every day. Our condo was perfect. We had a studio in building B and 100% would stay in it every time if we can! The only criticism we and others we spoke to had would be that there's no music allowed at the pools. We all agreed it would be fantastic to have music allowed at one of the pools. Even just general music being played at one pool would be nice. All in all we cannot wait to return to the Papakea again soon! This is our eighth time in Maui, fourth at the Papakea and second in B303. This condo is in one of the buildings closesr to the pool and ocean and the views are spectacular. The condo has a fold down bed and fully equipped kitchen. The bathroom is spacious and the shower is great, nice turtle stone inlays. In unit washer and dryer is great to have. Toilet paper, dish soap and paper towels are provided. This will be our condo of choice to rent from now on. Richard the owner is very responsive to emails and any concerns or questions you may have. Papakea Owner's Association will collect a $17/ night Resort Fee (for the first 10 nights) payable to the Association at checkout. Rates subject to change until reservation is confirmed.